Each year millions of pets become lost or displaced. In fact, one in three pets will go missing during their lifetime. At Animal & Bird Health Care Center, we have used the the AVID® microchip for the more than 10 years. The AVID® Microchip is an implantable medical device that safely and permanently identifies your pet. Since 1985 AVID has successfully reunited millions of lost pets with their owners. ​The AVID Microchip is an implantable, integrated transponder about the size of a grain of rice. 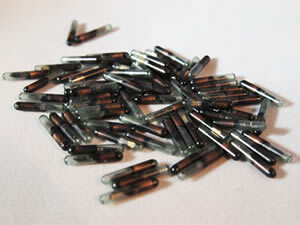 The microchip is encapsulated in bioglass to prevent tissue irritation and microchip migration. The microchip is not a GPS, does not use batteries and becomes energized by a microchip scanner. The microchip is permanent and will last the life of the pet. Each microchip has a unique identification number encoded into its integrated circuit. When enrolled in a pet recovery service this number links the pet to the owner's contact information. Microchips are typically injected between the shoulder blades with a syringe. The procedure is similar to receiving a vaccination through a needle and most pets don’t even react when the microchip is injected. The microchip provides a safe, permanent form of identification. It's like getting a vaccination against being lost! We can place microchips in dogs, cats, ferrets and birds. ​Ask us about this amazing safeguard for your pet.